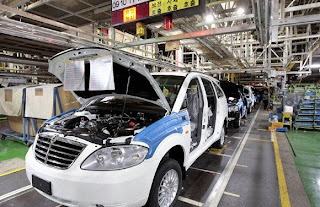 More than 900 armed workers have stormed SsangYong's plant in Pyongtaek, South Korea. This isn't the first time the Korean firm has had problems. In December 2008, SsangYong was unable to pay it's workers. The strikers were armed with pipes and firebombs, and are reported to have attacked some of the 4,000 people who had re-entered the plant in a bid to get the assembly line back into operation following a shutdown while the company was in receivership. More than 80 people are injured in the clashes and the plant is now reported to be under the control of the rioting workers. Reports suggest that support for the rioters is growing, as local people join their demonstrations against job cuts. The violence was sparked after a court appointed administrator said SsangYong had to axe 976 of its workforce at the plant, from a total of around 5,000. Of those facing the axe, around half were offered an improved redundancy package for early retirement and half were offered jobs with affiliated companies or in the SsangYong sales operations. Any remaining workers were told they would be rehired in 2012 if they hadn't found alternative work. However, the union representing the workers rejected the offer, and workers have been occupying the plant since May. Following the violent clashes as non-unionised workers tried to restart the plant, Ssangyong's administrators have said they will not try to restart the plant again, adding that the company would almost certainly go into administration as a result of the union workers' actions if they did not leave. Ssangyong's management has until Wednesday 15th July to submit a viable restructuring plan to shareholders and the administration court. The court will make a ruling by 15th September whether to permit SsangYong to keep operating or liquidate its assets. It is not yet clear how the strikes will affect production of SsangYong's vehicles, including the forthcoming C200 SUV.